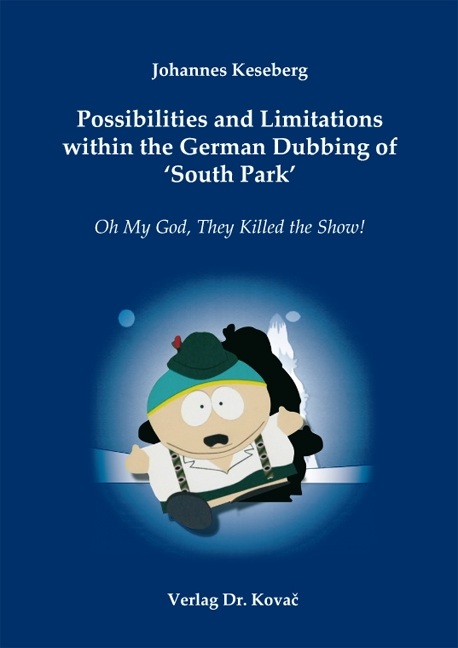 Possibilities and Limitations within the German Dubbing of ‘South Park‘. Forschungsarbeit von Johannes Keseberg, Verlag Dr. Kovač 2010, 264 S.
Oh My God, They Killed the Show! Whereas the animated television series South Park has enjoyed massive success in the USA for over a decade, the German dubbed version is only a shadow of its original US counterpart in terms of viewer ratings and audience popularity – a gap obviously stemming from cultural and linguistic transition during the series’ dubbing into German. However, instead of presenting a self-righteous witch-hunt, this study carefully throws light on the highly complex field of audiovisual translation and respects the multi-faceted intricacies complicating the dubbing process – the resultant questions all serving to find the answer to if, why, and how exactly the German dubbing could have had a hand in dooming South Park into its rather mediocre appeal to German viewers. As surprising and outrageous as some of the discoveries may seem, they are only another distressing cenotaph to the inviolable primacy of profit over product and the responsibility of presenting all non American viewers with a translation as adequate as possible.